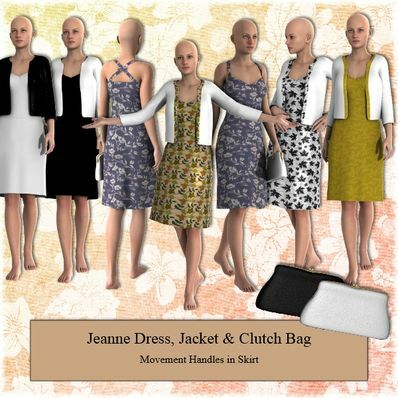 Jeanne Dress & Jacket for Genesis 2 Female for use in Das Studio 4.6. Thanks for all this .. Thank you so much! This looks lovely! That must be the fact I am on mac. :( I asked for this problem with Daz people, and they said the recent product doesn't use the "&" sign anymore. But that is not a problem, if that works for everybody, i will continue to modify manually the support file. Thanks for your great job. Love the dress, thank you soooo much all the extras, the jacket is great and then the perfect clutch bag. On top of that you also included "movement handles for the skirt." Awesome! TKU so much! @RC&ski - I don't have any problems with thumbnails not appearing in Smart Content when the & is used. Also Daz uses the & on some of their products, so it must be OK to use. Very good, but, dear creator, stop using "&" sign in the name of your product, it cause problem in SUPPORT file. It makes "&amp;" appear in the support dsx file, and that make the thumbnail doesn't appear in smart content tab in Daz studio. That just because you use "&" instead of "and". Thanks for your work. Thank you! Very nice combination! A fine addition to my G@F Wardrobe. Thank You! Thank you. What was the film? Your stuff is consistently good quality and this is no exception. Thanks! I love this set! Thank you very much! I just love it! Thank you!